Eyelid surgery to correct malposition of the eyelids encompasses a wide variety of operations including correct inturning (entropion), outturning (ectropion) and drooping (ptosis) of the eyelids. Surgery (blepharoplasty) can also correct loose skin that hangs down from the upper eyelids and skin that hides the natural fold of the upper eyelid. 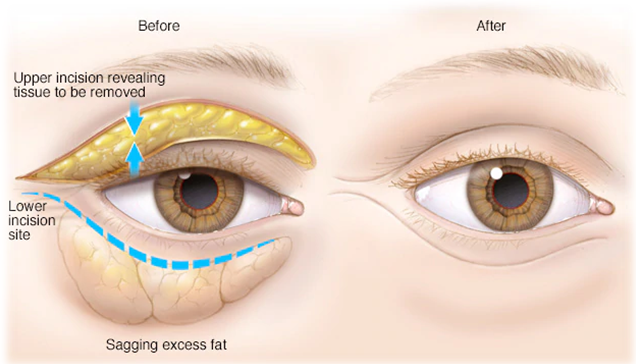 Oculoplastic surgery is also utilized in thyroid eye disease and for eyelid cysts, warts, masses, tumours and cancers as well as for eye socket (orbit) problems. If you are considering eyelid surgery, you need to consult an Eyelid (Oculoplastic) Surgeon for the consultation. 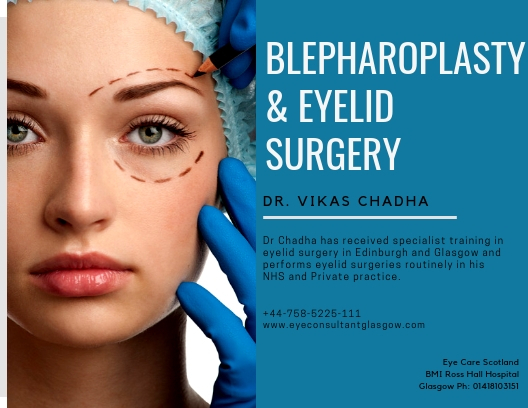 Dr. Vikas Chadha is one of the few surgeons who have been trained for Eyelid Surgery in Glasgow. Dr Vikas Chadha has received specialist training in eyelid surgery in Edinburgh and Glasgow and performs eyelid surgeries routinely in his NHS and Private practice. Dr Chadha has performed many hundreds of these operations and has an excellent track record of good functional and cosmetic results. If you are planning eyelid surgery, it may be useful to consult him before the procedure. Vision testing- Your eyesight will be checked. It is useful to have your most recent distance and near glasses and your most recent prescription from your optician handy. In some cases, your peripheral vision may also need to be tested. Ocular examination: – Our surgeon will conduct a thorough ocular examination, which may include testing your tear production and measuring parts of your eyelids. Eyelid photography: – Your eyes may be photographed for documentation and help with planning the surgery. Gently clean your eyelids and use prescribed eye drops or ointments. Avoid straining, heavy lifting and swimming for a week.